Submitter: My son brought back a book from his elementary school library that is just awful. The library is nice, they just completely remodeled it with a grant from Target, but some of the books on the shelf have been there since almost when the school opened in 1955. This one was old when I went to school there in the 1980’s and is ancient now! 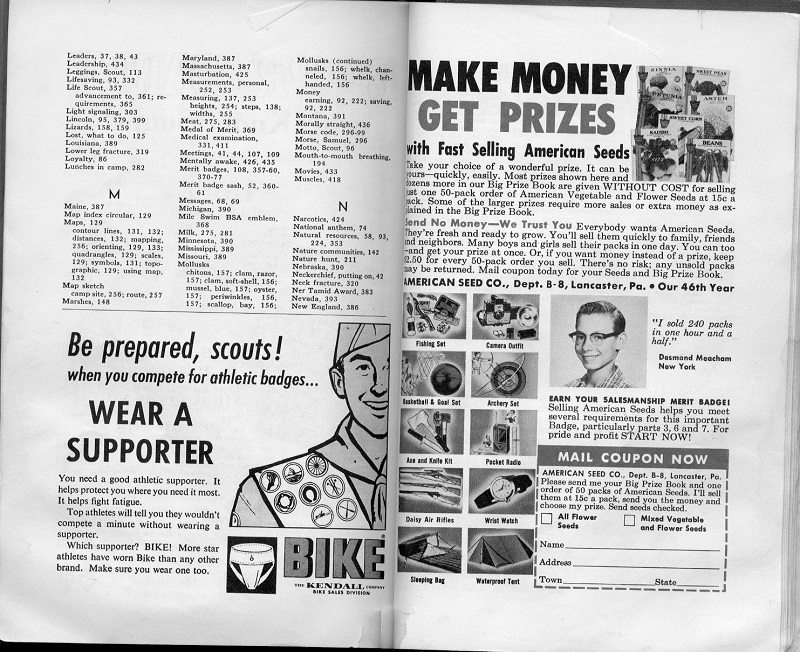 My son was looking for a book on knot-tying, so he brought home the Boy Scouts manual, but it is a 1964 edition and the last 20 or so pages are mostly ads for guns! Holly: This is just laziness. I can’t believe that any library worker truly believes that this book is valuable to a modern-day elementary school library. It’s cool in a nostalgia kind of way, but that doesn’t make it useful. The first image below advises young men who “cause emissions themselves” to avoid things that make them worry. And such behavior may cause them to worry…so they really shouldn’t do that. 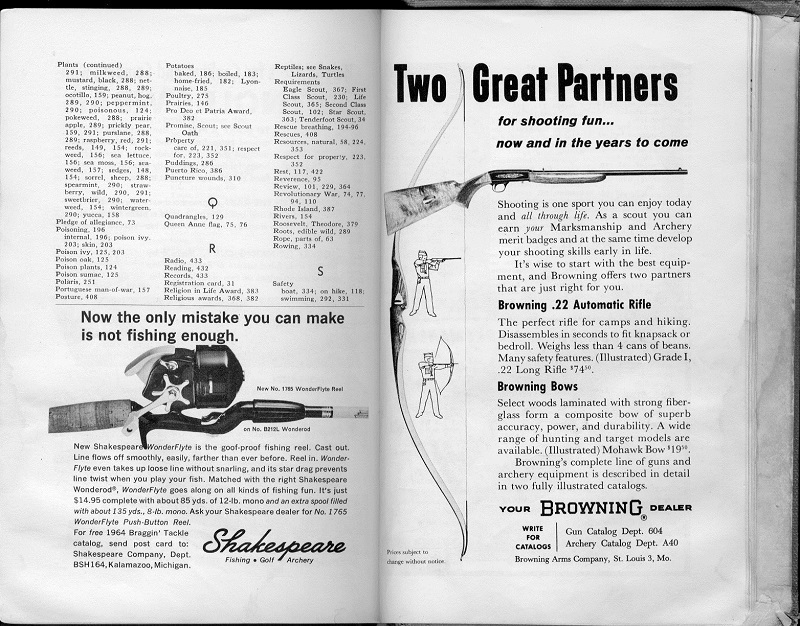 The gun ads are probably not in modern Boy Scout handbooks either, though I don’t know that to be a fact. Boy Scouts? Want to weigh in? 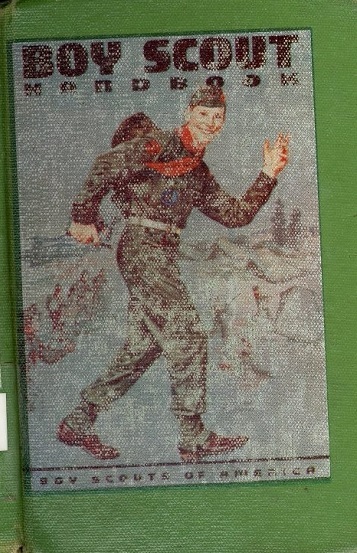 I bought a used copy of this old Boy Scout Handbook as a joke when I was a Boy Scout — in the 1980’s! It was already funny (but also interesting to see what parts had been updated for the then-contemporary edition, like the chapters on puberty and manhood). I’d be careful labeling it as “just laziness.” I think we’re all aware of how drastically underfunded elementary education is in this country. Perhaps the school does not have the resources or staff to adequately weed the shelves. Even if not in this case specifically, I’m certain in plenty of other schools around the country that this is the case. It was probably donated by one of the school’s founders or funders…very hard to sneak off the shelf! The submitter did say this particularly library was just completely remodeled; one would imagine they would check, update & weed the inventory as a part of that process. I am a teacher in a small primary school, and over the summer holidays we moved our small library from one room to another. In the process, we found *dozens* of books that needed weeding for outdatedness or condition (one of which has been featured on this site) and that only barely scratched the surface. Despite four days’ work by four people, it was all we could do to move, sort and re-shelve the books in time for school to re-open, along with cataloguing unlabelled books and deleting from the catalogue books we were weeding. No way could we have found time to properly weed. A remodelled library is all very well, but having a new physical space is something very different to having the time and people-power to look inside the books! Marksmanship (of all types) is a skill the Boy Scouts still teach, but they no longer have advertisements in their handbook. There is a very nice market for this kind of material. A lot of scoutmasters collect older scout materials. Do you think they’d be willing to trade for an up to date Scout Handbook? But I bet it taught him to tie knots! “Any real boy knows….” As opposed to Pinocchio? ACTUALLY this is one of my TOP books of all time!!! I don’t appreciate the “laziness” comment either. I was just hired as a school librarian in a small elementary school, and I am the first actual, MLIS-holding librarian they have had, EVER. I am also the the only library employee ever. I have a ton to try to do at once in my new position, and I haven’t had time to do a major weeding project in any one area. It is on the list of things to do, just not immediately, as I have to get circ and other things going at once. yeah, and where do you put a million outdated books before they actually leave the building??? Good luck–take your time, get to know the collection and the curriculum demands–then (*mwah-ha-ha! *) Weed! 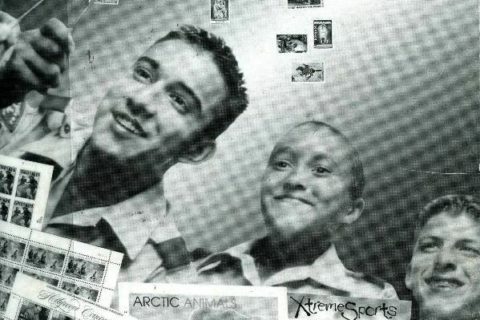 Sad to say Angel, but I thought the same thing…simpler times. I regularly leave older editions of books on the shelves until I can find funds to buy newer ones. That way the kids still have access to something on the subject and I can also justify the withdrawal of the book for the newer copy when it arrives. At my school I have to have the CEO’s approval for every book I withdraw. Submitter is right that it’s a shame about the gun ads since Robert Baden-Powell, way-ahead-of-his-time founder of Scouting, was keen that it should not be a paramilitary organisation. The basic idea was to give city kids a taste of the outdoor life, and for children of all social classes to mix in terms of equality. Young women quickly objected to their exclusion and more or less founded the Guiding movement, later led by Olave, Lady Baden-Powell, themselves! 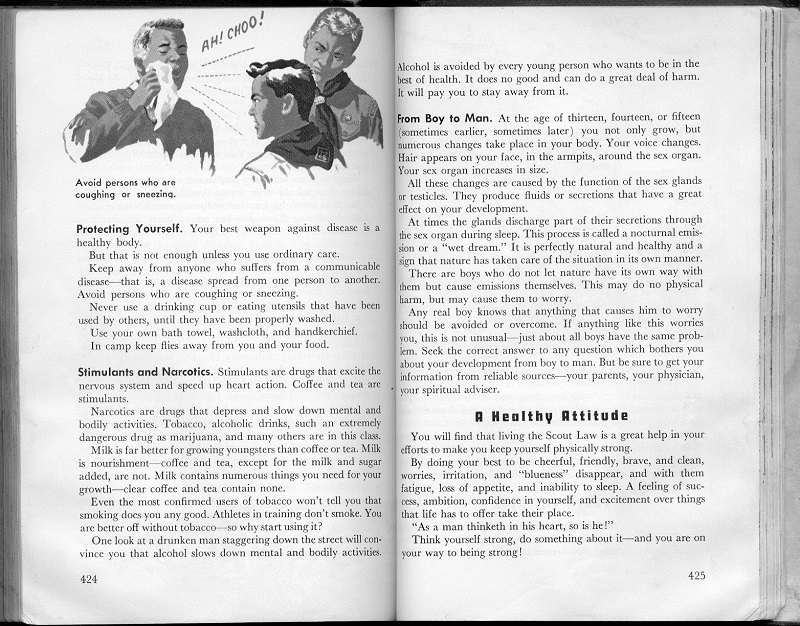 I will have to check my scout master brother-in-law’s manual to see if, like this one, it promises that following the Scout Law will keep away teen anxieties and depression. I’m guessing that he probably already has one from this time period. Scouting stuff is collectible, but condition is important. This is a library-bound edition. Pulp it. Ask a local Scout troop — preferably one whose members attend your school — to donate new manuals. Even better, see if the Scouts can help you with a service project. I *was* a Boy Scout during the 1980’s and 1990’s, and I am happy to add my opinion. The first set of images tells boys to avoid alcohol, tobacco, and mostly consume nutritious drinks instead of caffeine. It advises that instead of stressing about ejaculating a boy look for a trusted source of information. 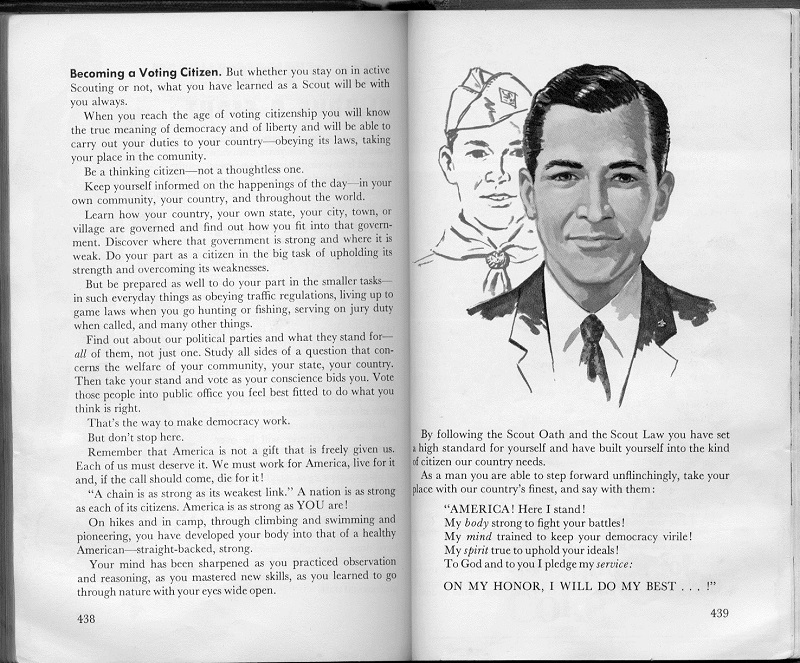 Subsequent pages advise a boy to obey the law and get involved in civics and the community. 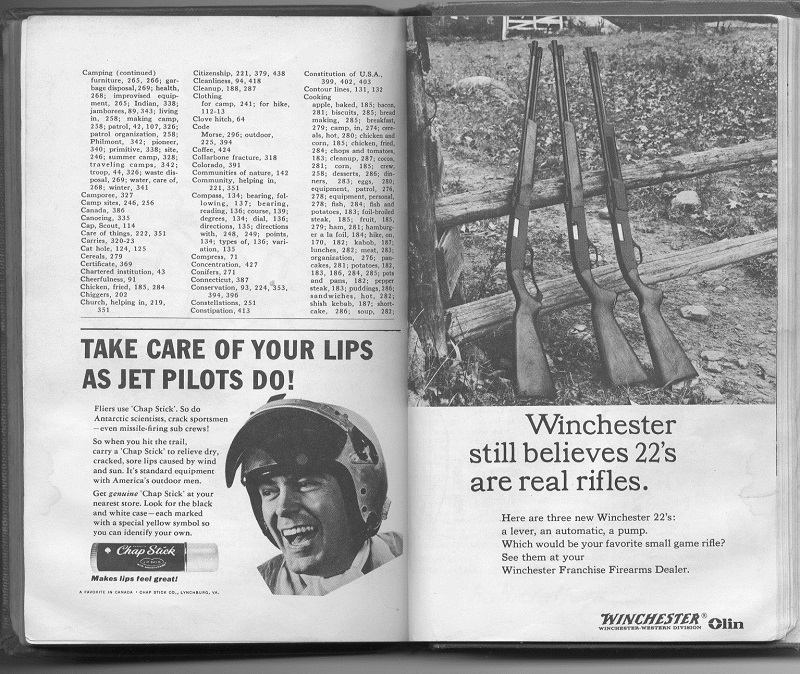 Are the gun ads tacky and dated? Probably. But archery and shooting were two of the activities we learned. We learned the rules and had fun. So even though it’s easy to deride this for being dated and unhip, I think there is redeeming information in the pages posted. Ah, revisionist thinking, it’s always so easy. Maybe one day people will look back on us in our time (those of us who think we’re the most advanced) and laugh at some what we take serious now which will be proven or disproven. Only time will tell. Do bear in mind that firearms and firearms training is still a big deal in a lot of places. I’d rather have scouts trained in firearms safety shooting at paper targets, than gang bangers shooting at people with no ethics at all. Be careful too what you think is hip. In my rural town it’s becoming quite hip for hipsters to hunt and dress game and animals as part of a re birth in knowing where your food comes from. Making bows and arrowheads, animal tracking. Those were things I learned as a Boy Scout in the 60’s and now they’re hip. The lines begin to blur. Go figure.